Tiopronin and mercapto-undecyl-tetraethyleneglycol (Figure 1) have been used for monolayer surface protection of gold nanoparticles, but both have problems associated with their use. Using tiopronin as the monolayer for a gold nanoparticle surface above 40μM causes severe renal damage that ultimately kills test animals. (2) Mercapto-undecyl-tetraethyleneglycol has been shown to have poor water solubility when added to the cluster as the monolayer. To reduce the damage caused by tiopronin in vivo mercapto-undecyl-tetraethyleneglycol is added to the monolayer in high concentrations. (2) These high concentrations create anti-PEG antibodies to attack the cluster and make it unreactive by the mechanism known as opsonization. 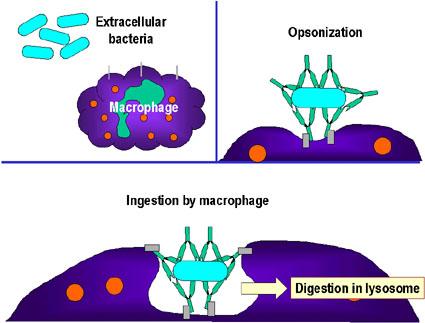 (1) Opsonization (Figure 2) occurs when anti-PEG antibodies react with the monolayer and render the cluster unreactive and is removed from the body. 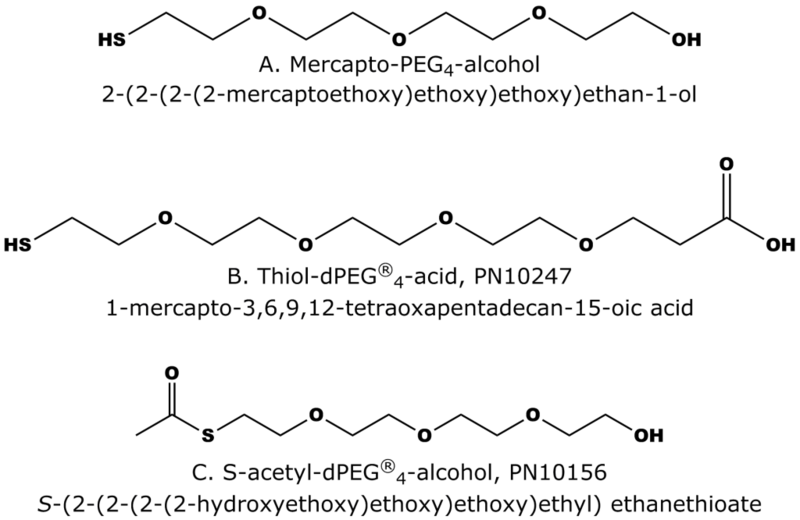 Figure 2: Process of Opsonization. Picture copyright 2011 by The Board of Trustees of the University of South Carolina. http://www.microbiologybook.org/bowers/immune%20cells.htm Used with permission. Short-chain, thiol-dPEG® compounds used in a mixed monolayer with tiopronin increase the water solubility of the tiopronin short-chain monolayer as compared to a mixed monolayer of tiopronin and mercapto-undecyltetraethyleneglycol. This increase in water solubility is attributed to the elimination of the akyl chain of the mercapto-undecyltetraethyleneglycol. A mixed monolayer containing 10% short-chain, alcohol-terminated dPEG® (Figure 3a) on the gold nanoparticle showed no renal damage or other toxicity. (1) The short-chain dPEG® apparently shields the cluster from opsonization and allows for fluid movement of the monolayer, which is thought to be the mechanism that thwarts opsonization. (1) Note that Quanta BioDesign sells the S-acetyl protected version of this alcohol as product number 10156 (see also Figure 3c). In studying surface protection of gold clusters, Thiol-PEG4-alcohol and Thiol-dPEG®4-acid were compared. 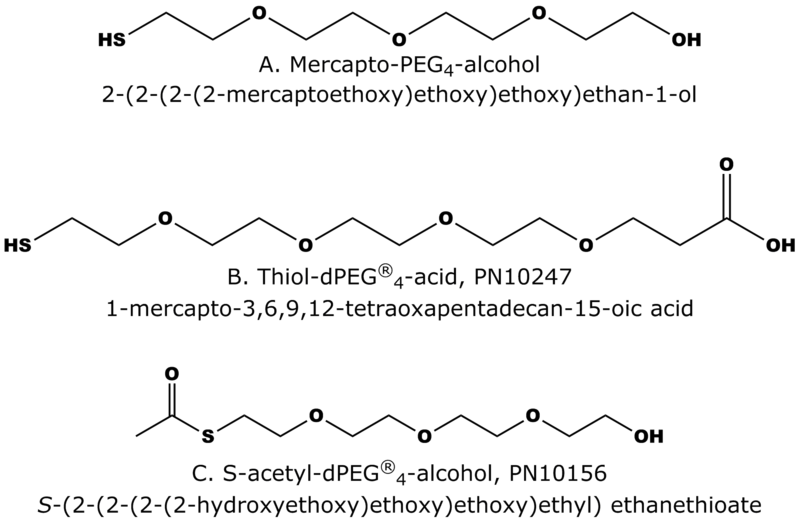 A. Thio-PEG4-alcohol. B. Thiol-dPEG®4-acid (Quanta BioDesign PN10247). C. S-acetyl-dPEG®4-alcohol (Quanta BioDesign PN10156) which is the S-acetyl-protected version of 3a). This product was not used in this study, but it can be used for future, similar applications. PEG chain length directly affects residence time in the body. Short-chain dPEG®s have been shown to move through the body much faster (24 hours) than longer chains (2-4 weeks)(1) For applications where a short residence time is desirable, short-chain dPEG® compounds are a strong asset, because they provide high water solubility, no immune response, and no toxicity issues. Short-chain dPEGs® make a difference in the biological aspect of surface protection chemistry. Quanta BioDesign is the inventor of, and world leader in, dPEG® technology with a vast range of products with varying length and terminal groups with high purity (>90%) for your convenience. If you do not see a product that you want, please call or e-mail for custom synthesis! We want to help you get the best out of your scientific application! Click here for general surface modification products from Quanta BioDesign. Click here for metal surface modification products from Quanta BioDesign. You can see all of our lipoic acid derivatives in our Metal Surface Modification Reagents list. I think everything typed was very logical. But, what about this? Protection of Gold Nanoparticles With Short-Chain PEG is a little boring. You ought to peek at Yahoo’s home page and note how they create article titles to get viewers interested. to grab readers interested about what you’ve written. In my opinion, it might bring your website a little livelier. Thanks for your comment. We really appreciate you taking the time to read the article and think about it. We’re aiming to appeal to a highly technical, scientific audience. What title do you think we should have used? We would be delighted to have you share our content any time. Thanks for your kind comments. We appreciate them very much and hope you spread the word about our products.